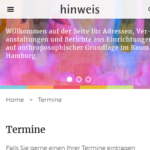 The new website for anthroposophical magazine “hinweis” for addresses, events and reports concerning Anthroposophical institutions in Hamburg is now online. Realized by STADTKREATION in charge of the “hinweis” editor and Gemeinnützige Treuhandstelle Hamburg. Design: Liane Haug.